UNITED NATIONS, April 30 -- After hours of wrangling over Western Sahara, the UN Security Council past five o'clock on Friday passed a resolution for the annual extension of the mandate of the MINURSO mission there, without the contentious phrase "human rights" being included. As Inner City Press reported throughout the day, in the Council's consultations room France and its former colony Gabon drew a line in the sand on Western Sahara. Hovering outside the consultations was Morocco's ambassador, as well as a representative of the Polisario Front. After twists and turns, posturing and the calling of bluffs, a compromise was reached and voted on. There were only three changes to the draft resolution issued by the so-called Group of Friends, made up of France, the US, Russia, UK and Spain. The euphemism "human dimension" wasn't changed, but a reference to the roles of the UN system was added, which some argued meant human rights. The word "reaffirms" was added to the first paragraph -- very tough -- and the word "existing" was added near the end. That was it, but it was enough for Uganda and Nigeria, and also Mexico, to remove their threats to abstain. Afterwards, Inner City Press asked Morocco's Ambassador whether he understand the existing mandate of MINURSO to include holding a referendum with independence as an option, and why his country had so vehemently opposed any reference to human rights. He ignored the human rights questions, and said that rather than independence, a political process had begun. Finally, after repeated dodges, Inner City Press got to ask him again about human rights, and whether Morocco's exploitation of the resources of Western Sahara is illegal. He said Morocco is against the misuse of human rights, and that he would provide figures showing how few resources of Western Sahara Morocco takes out. We'll be waiting. At the end, Polisario's representative came out, and openly denounced France. Inner City Press asked what natural resources are being exploited. Phosphate and fish, was the answer. Afterwards Christopher Ross joked about Inner City Press' previously description of him as genial (as well as looking strangely like UN top political advisor B. Lynn Pascoe, who it was announced Friday is shortly to go on a delayed trip to Sri Lanka.) Several delegations re-confirmed to Inner City Press its report of China's quip that while it was usually described as with Russia, now French had joined it in its position on human rights. 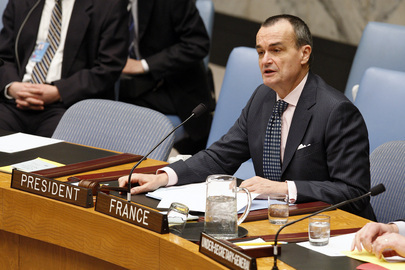 French Ambassador Araud, who should have answered on this, was long gone, on his way to the UN's Greentree retreat about peacekeeping. A Council member told Inner City Press that Araud off the record had said the French position on Sahara was not necessarily his, but was decided from on high. Nicolas Sarkozy was in China. The annual showdown on Western Sahara now over, the UN breathed a sigh of relief and prepared for the NPT and Mahmoud Ahmadinejad on Monday. Watch this site. On W. Sahara, Prospect of 3 Abstentions, China Bonds With France on Rights, Morocco Given Veto Power? UNITED NATIONS, April 30 -- Six hours into Western Sahara negotiations in the Security Council, the threat to call the vote was made. There would be three abstentions against the resolution drafted by the so-called Group of Friends: Uganda, Nigeria and Mexico. Frente Polisario says it could live with this language, and is angry that Morocco has become on this issue the one in "P-5 Plus One." Others wonder if France only agreed to put this language to Morocco because it knew Morocco would shoot it down. Inside the consultations, Inner City Press is told, Austria's Ambassador wondered out loud how France, so important in forming the concept of human rights, could be so vehemently opposing the inclusion of the term in the Western Sahara resolution. Whereupon the Chinese representative slyly said he was glad that Chinese was no longer alone in its position on -- and against - human rights being considered in the Council. 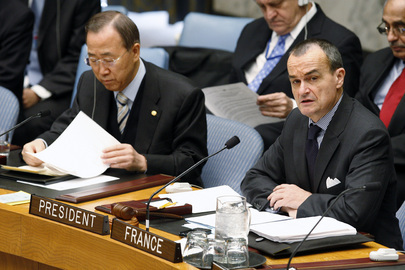 France's Araud, with UN's Ban, close to China on human rights? This echoes a statement by China when France was calling for humanitarian intervention into Myanmar after cyclone Nargis. As Inner City Press exclusively reported, China responded that when thousands of French elderly died in the heatwave when doctors were on vacation, it had not called for intervention. This angered then French ambassador Jean Maurice Ripert. And now Gerard Araud? On timing, the UN's note takers have already left for the Greentree retreat on peacekeeping. At some point the Ambassadors will have to go. Last year, the MINURSO extension talks started in the afternoon, and went to 11 p.m.. And this year? Watch this site. Update of 5:10 pm.- Araud notes he should have left for Greentree 10 minutes ago. Predicts unanimity. Chinese laughs at story of bonding with France on rights. Update of 5:41 p.m. -- the only change to the draft in blue is a reference to MINURSO's existing mandate, a hat tip to the call for a referandum. But as Nigeria pointed out, the draft does not refer to the 1991 resolution on the referendum. Still Nigeria and Uganda and Mexico voted for it, 15-0. Japan's Takasu has brought his month to a close. His staff have entered the Council with hand trucks, to move their paraphenalia. Speaking after the vote are the U.S. and now Araud and Mexico. UNITED NATIONS, April 30, updated -- As the Western Sahara resolution was taken up by the UN Security Council on Friday morning, possible compromises were floated, including one which would call on Morocco and the Polisario Front to work with the UN High Commissioner on Human Rights Navi Pillay. France, however, was said to oppose any change to the text they shepherded out of the so-called Group of Friends on Western Sahara. The UK is a member of the Group. On April 29, UK Ambassador Mark Lyall Grant told Inner City Press that while his country thought the text was balanced, it would be happy to see human rights language in the final resolution. Last year the fight devolved into a reference to the "human dimension," not human rights. This year, the question is what mechanism to use. Putting human rights into the mandate of the UN Mission MINURSO seems unlikely. 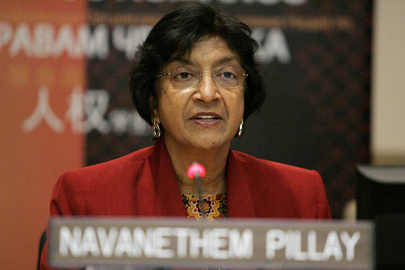 Rather, the floated compromise would call on the parties to work with Navi Pillay. Polisario, however, says that one of the parities -- Morocco -- would resist working with Ms. Pillay. Morocco would, so to speak, draw a line in the sand on Western Sahara. Polisario would prefer that the resolution call on the High Commissioner to work with the parties, or with MINURSO. In the balance: the planned Council retreat to Greentree, about peacekeeping operations. Polisario is deploying the "Trojan horse" of human rights, as the Moroccans put it. They mock the human rights records of Uganda and Nigeria. Their scorecard on the Group of Friends: France and the U.S. pro Morocco, Russia and Spain "leaning toward" Polisario, and the UK in the middle. But, Inner City Press asked, why are there no African or even Arab countries in the Group of Friends? It was established a long time ago, was the answer. Maybe it must change. Update of 11:25 a.m. -- the Council has gone into recess. Austria notes that there have been 55 resolutions on Western Sahara, 53 of them unanimous. Why not today? Update of 12:02 p.m. -- a source exiting the consultations describes "a French proposal to change the perambular paragraph about the human dimension....We feel excluded by the process, the Group of Friends is composed of only four Council members and one non member [Spain], so eleven of us are excluded. So we expect from flexibility now." But the reference to Navy Pillay may not happen. Question: does the revolve of at least some of the excluded ten foreshadow what will happen if and when the P5 Plus One come out with an Iran sanctions draft? Watch this site. "Stressing the importance of making progresss on the human dimension of the conflict as a means to promote transparency and mutual confidence through constructive dialogue and humanitarian confidence - building measures"
Now, after Mexico carried sandwich in -- bad sign, one said -- word is that Uganda and Nigeria would abstain. Would that be unity? Update of 3:11 pm - Gabon's Ambassador tells InnerCityPRess, "We don't need to mention human rights! Human dimension, ok." How about human element? "Maybe."